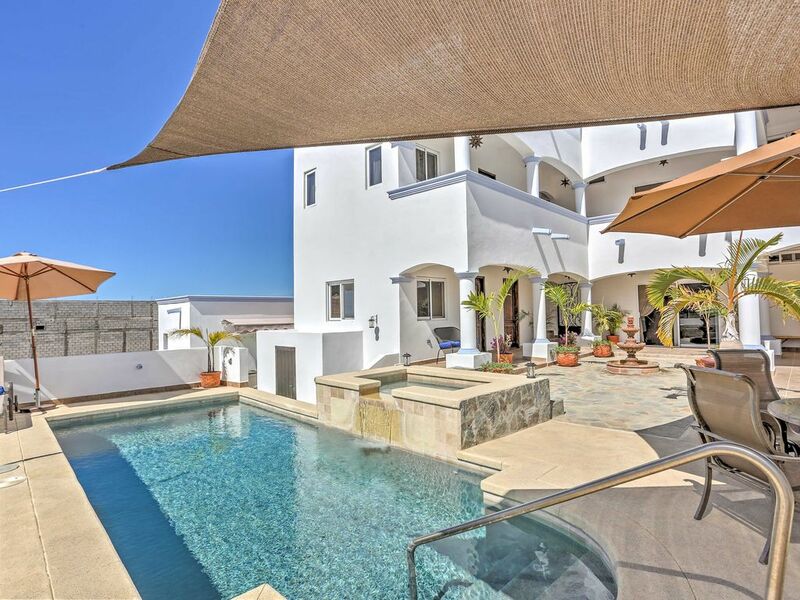 Head south of the border to experience a slice of heaven at this vacation rental in the vibrant village of Todos Santos! With space for 2, this home will provide you and yours with a once-in-a-lifetime getaway. Whether you’re looking to surf the ocean waves or hike the soaring mountains, you’re sure to find everything you’re looking for while staying here! Through a secure wrought iron gate and arched terraces, you’ll find your personal Mexican paradise. Being on the second level, enter into the bright and open living area, adorned with a plush queen-sized canopy bed, 2 bedside tables, dining table, and 2 chairs . Equipped with ceiling fans, this room will help keep you cool during warmer months. The living area opens up to the kitchen area, where you’ll find a sink, cabinets, mini refrigerator and freezer, and microwave. The bathroom reflects the intricate tile details of the Colonial Mexican decor that runs throughout the property. When you want to bask in the sun from the comforts of home, walk outside onto the building’s shared courtyard, which features a fountain, sparkling pool, spa, and lush gardens. A unique feature of this home is its Sky Deck Entertainment area, where guests can enjoy access to a rooftop sun deck and astronomical observatory with a 10-inch reflector telescope! The views from this roof deck are simply unbeatable, and it is a wonderful place to watch for whales from November until the end of March! This building’s stellar location gives you access to the area’s most desirable attractions - from the beach to the quaint village of Todos Santos! You’ll love your proximity to a number of different beaches, including La Pastora, Playa Las Palmas, and Cerritos, which are all great for swimming, surfing, body boarding, and sunbathing! This area is full of wildlife! You can watch manta rays and bat rays swimming offshore, and do some excellent surf fishing when the season is right. This area is the bird watcher’s dream, with over 400 different species in the area! There are even several turtle hatcheries just down the beach where you can watch the hatchlings scamper down the beach into the waves. The actual village of Todos Santos has been selected as a “Pueblo Magico” by the Mexican government. These towns are chosen because of their historic background, charming features, and picturesque buildings. Guided walking tours are available, or you can mosey through the sleepy town on your own! In the town, there are countless good restaurants with a broad variety of cuisines and prices. You’ll also find a range of boutiques and handicraft shops to explore. Depending on the time of year, there are many public events to attend, including an international movie festival, several music festivals, art festivals, a mango festival, Mexican music and dance concerts, a food and wine festival and more! For active travelers, Todos Santos is the base for a number of eco-tour operators, offering whale watching tours, bicycle tours, kayak rentals, diving tours, deep sea fishing, and surfing lessons. - Complimentary guest membership access to the nearby El Faro Beach Club & Spa including: climate controlled swimming pool, beach facilities, lounge chairs, cabanas, changing rooms, bar, and restaurant - A Mexican Grill featuring fresh seafood from the nearby fisherman's landing. - A special feature of this studio is that it is served by a whole house water filtration and purification system which means every faucet, shower, and spigot flows with water purer than the most expensive bottled water. - Todos Santos is also the base for a number of eco-tour operators, offering whale watching tours, bicycle tours, kayak rentals, diving tours, deep sea fishing, and surfing lessons. Casa Oasis is a true vacation paradise. The weather in Todos Santos is picture perfect....warm, sunny days with little humidity and cool evenings. Staying here was very relaxing and comfortable. The property is gorgeous with everything you could need and the hosts, Patricia and Charles, are charming and very gracious. Highly recommended! Charles and Patricia are wonderful hosts, and the spaces they have created at Casa Oasis are truly splendid. The day passes at El Faro Beach Club are an incredible bonus. Staying at Casa Oasis with Charles and Patricia was a dream. Their hospitality coupled with the luxurious comfort of the room, the quintessential Baja California view of the ocean, and the unbeatable climate made for a perfect stay. Charles and Patricia went out of there way to take care of all our visitor needs (they even bought a new iron just because I needed one)! The telescope and night sky were like the cherry on top. Couldn’t recommend it more!